(Jacksonville, Fla.; October 26, 2010) – When Crowley Maritime Corporation’s liner services group takes delivery of 355 new 40-foot high-cube refrigerated containers later this year, it will mark an important milestone on the path to world-class environmental stewardship: conversion of nearly a quarter of its refrigerated fleet to Carrier Transicold PrimeLINE® units, the industry’s most energy-efficient container refrigeration units. Carrier Transicold is a part of Carrier Corp., a unit of United Technologies Corp. (NYSE:UTX) Carrier Corp. is the world’s leader in high technology heating, air-conditioning and refrigeration solutions, improving the world around us through engineered innovation and environmental stewardship. The latest 40-foot high-cube refrigerated containers are also Crowley’s first to use sustainable polyurethane technology foam, a highly efficient insulator with substantially lower global warming potential than conventional insulation. “As a result of the way the container is designed and insulated, combined with the PrimeLINE unit from Carrier, we anticipate long-term efficiencies, even as the units age,” Azzo added. 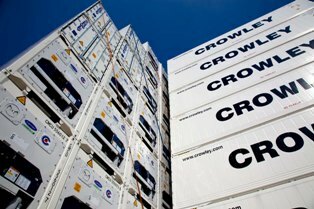 A leading ocean cargo carrier within its service region, Crowley dedicates most of its refrigerated containers to perishable produce trade, although Azzo said the PrimeLINE unit’s high performance at the lowest temperatures will also serve in the delivery of frozen foods such as ice cream. With the recent order for 355 PrimeLINE units, Crowley will have a total of 755 of the industry-leading digital scroll units in its growing fleet of 3,250 refrigerated containers. The PrimeLINE unit uses digital scroll compressor technology and was developed to help shipping lines conserve fuel and reduce emissions related to shipboard power generation. It is the industry’s most efficient container refrigeration unit and has the highest deep-frozen capacity of any unit using non-ozone-depleting R-134a, the refrigerant with the lowest global warming potential of all contemporary container refrigerants. Crowley acquired its first PrimeLINE units in 2009 following extensive field-testing in 2008.